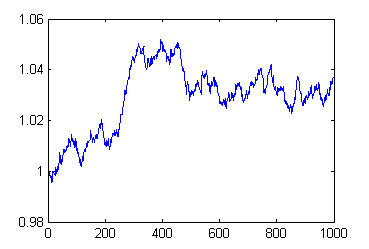 the idea is to simulate price returns thus to be normally distributed i 'am trying to use subordinated arithmetic brownian motion subordinated to time activity (volume) stock prices are following GBM then you can say $$ dS_t=μS_tdt+σS_tdW_t $$ where the time considered is not the calendar time but activity time (Ané & Geman 2000). I faced problems while implementing it in matlab so any help would be appreciated. Here it is. Returns here are normally distributed by construction. It doesn't involve time scale, you can use time, volume, or any other "activity". Not the answer you're looking for? Browse other questions tagged programming finance or ask your own question. Why is my Euler discretization error increasing with number of steps?